Walking around to the right, we see the south transept and, of course, the magnificent dome. 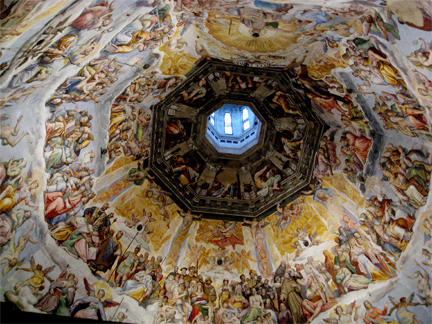 The dome is a creation of the Renaissance, and set the pattern for so many domes to follow. Walking into the Cathedral, one cannot help but feel the darkness. Light, so dominant a force in French Gothic designs, is almost totally absent in most Italian churches, and especially here in the Cathedral of Florence. Just to review and add a date: the design and construction by Arnolfo di Cambio was 1296 to 1302 or 1310 – Arnolfo died, and work was halted until 1334 when Giotto (designer of the adjacent Campanile) was appointed Master of the works. Giotto was followed by Andrea Pisano and Franceso Talenti. Talenti enlarged Arnolfo’s original design in 1357. A commission of architects laid out the choir and transepts. 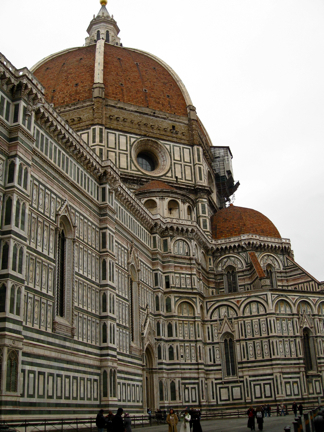 The dome was designed by Filippo Brunelleschi, with work commencing in 1420, carrying on until 1434. 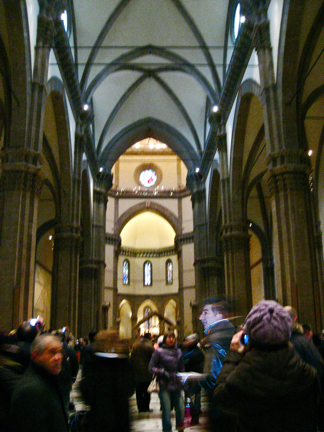 Giuliano da Maiano placed the lantern on top of that dome in 1462 after Brunelleschi’s death in 1446. The nave was created by large Gothic vaults resting on wide arches that divide the space into four square bays, each measuring 18 meters (60'). 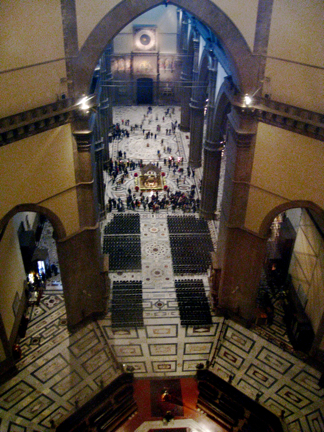 The height of the nave is 40 meters (130'), giving a more classical than Gothic harmony to the structure. The arches rest in their turn on powerful composite pilasters similar to those Francesco Talenti used for the Loggia dei Lanzi. What is present today is probably the result of Talenti's variations on Arnolfo's design, which foresaw a major number of bays and pilasters (and therefore windows). The plan is basically a Latin cross and its nave measures 153 meters (502') in length, and is 38 meters (125') feet wide. The transepts bring the width to 90 meters (295'). 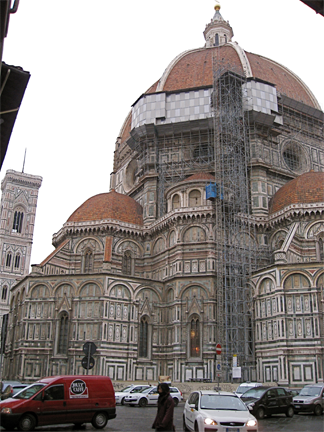 Originally the crossing measured 45 meters (148') on a diagonal (some sources indicate 3 meters (10') less; or, by coincidence, one would assume, the same size as the Baptistry. This was an unusual width in Gothic architecture and was to create a great many technical problems when the time came to close the whole area with a vault. It was left to the competition winner Brunelleschi to resolve this structural challenge begun by Arnolfo di Cambio. Realize we are talking about one half of a football field (American-type – the International Soccer / Futbol field is considerably larger). To repeat: it was basically designed in the early 1420s and constructed by 1434. 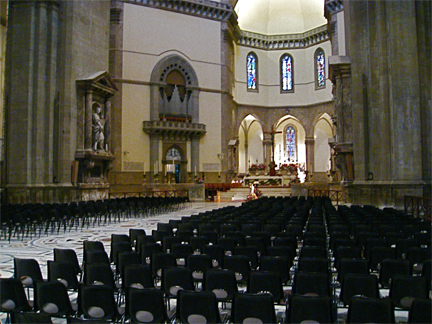 The nave bays are flanked by singular rectangular bays on each side, running in length towards the transept crossing. In other words, this is a three-aisled church. The aisles are as long as the nave bays, but much narrower. All the bays have quadripartite construction. Piers in the nave have attached ribs, and unmolded pointed arches form the bays of the arcade. There is no triforium gallery, and the only light in the nave comes through very small, by comparison to the size of the building, clerestory windows. This lack of window opening, the solidity, all seem to go back to Italian Early Christian Development (see SESSION FIVE). 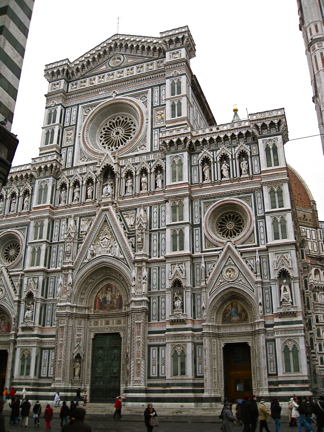 It needs to be understood that Italy- or what is now the country of Italy, formerly composed of city states – began Christian church building, and massive new construction was unnecessary in this period of time. France, by contrast, was newer to the religion, and the demand for church construction was greater and, as it turned out, most innovative. So France developed the quest for light, accompanied by the kind of construction, which would accommodate that openness. Even in the very Gothic Cathedral of Milan, to be discussed below, light is minimal; very spiritual, but never the less minimal. The two transepts and basic apse are almost identical, in that they are semi-circular, with no openings from the exterior; in other words, no South or North portals as was observed in our study of French Gothic designs. Approaching the crossing, with the dome above. 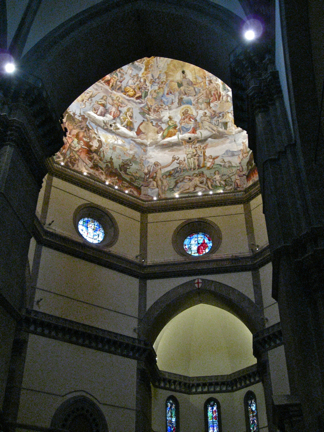 You will notice that the dome, covered with frescos, has been artificially lit. This is a look into the drum section of the lantern. Flash was not used, but the resultant light is from the aforementioned artificial lighting, installed at the base of the dome. This is a view of the exterior of the south transept on the left, with one of the three apses on the right. Do notice the minimal window openings. The three apses, in effect, are separated by the two sacristies (containing bas-reliefs by Luca della Robbia), and open into the common area of the transept. Each apse is divided into five chapels. The chapel behind the high altar contains Ghiberti's masterpiece of goldsmithery: the Urn of St. Zanobus. Below Brunelleschi’s dome stands the huge octagonal chancel curtained off by an elegant marble balustrade by Baccio Bandinelli (1555), which was once decorated with numerous bas-reliefs and statues, many of them now conserved in the Museum of the Opera del Duomo. As a statistic, the volume of space inside the supports of the dome equals the area of the Pantheon in Rome, while the height about doubles the volume of the Pantheon, rising to nearly 90 meters (300'). Indeed, a comparison is made by Trachtenberg and Hyman (Architecture from Prehistory to Post-Modernism) that the composition of the Cathedral massing “… suggests … the swelling, ponderous masses of Roman Imperial monuments....” The monument, for indeed it is of monumental proportions, was created in its totality years before Brunelleschi, by a vote of the Florentine citizenry, and was the physical interpretation of the power that enabled the realization of their civic pride. This alone is something to ponder: a fact that knowledge, artistic and architectural comprehension of a citizenry, is what so often throughout history has propelled cities to civilized greatness. A time for reflection, perhaps. Think about the city in which you grew up, lived, or worked, or perhaps just visited: is or was there a particular architectural example of civic pride? Was it successful? How do we, or should we, measure “success” in an urban environment?